Since spring is currently in full bloom, weddings are starting to blossom throughout the country in the wake of warmer weather and sunny skies. Finding an appropriate wedding gift for the bride and groom can be a somewhat daunting task, as everyone wants to give something elegant, of good taste, and functional. In addition, everyone wants their gift to be memorable and greatly cherished by the newlywed couple. With our selection of personalized wedding gifts, you can achieve all those motives. There’s nothing quite like a gift with the recipient’s name engraved on it, as it shows the extra effort put into the gift selection process. Being that wedding gift shopping is already quite a time consuming task, imagine the appreciation the bride and groom would feel knowing that you went the extra mile to commemorate their special day. This customized tarnish-resistant picture frame is made of chrome and enamel and features an embossed leaf branch pattern around the frame with rhinestone detailing to give a beautiful, luxurious feel. Help the soon-to-be-married couple cherish their big day with this truly one-of-a-kind wedding gift idea, which holds a 4″x6″ picture. Feature one line of personalized text on the bottom of this 5-5/8″ x 7-5/8″ frame to make this personalized picture frame a stand-out wedding gift. 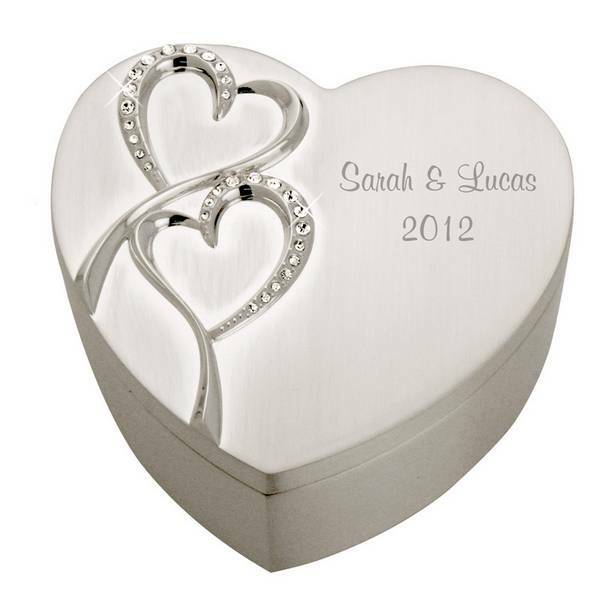 Keep the wedding bells ringing long after the wedding for the married couple with this exquisite silver-plated keepsake box, with features an elegant embossing of hearts. This personalized keepsake box measures 4″ x 4″ x 1 3/4″ and makes for a great jewelry box or storage box for precious treasures. Fancy script text engraving of one line of text on the face of this keepsake box makes this item ideal for any newly-wed couple! Wedding days aren’t just about the couple getting married- they’re also about the joining of friends and two families. Help the couple-to-be store all the colorful memories of their wedding day in this beautiful customized white wood picture frame, which houses room for five pictures. The right side of this frame features the phrase “Our Wedding Day,” allowing room for a 5″x7″ picture of the special couple while the left side creates for a creative way to show your wedding invite. 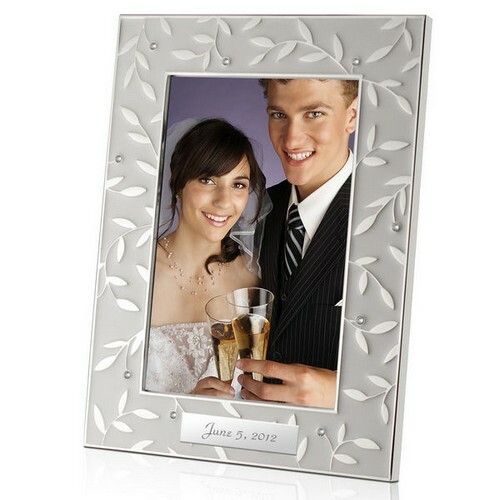 Complete this dynamic wedding picture frame with the couple’s names and wedding date at the bottom of the right panel. Such an impressive and thoughtful gift is sure to delight the wedding couple! 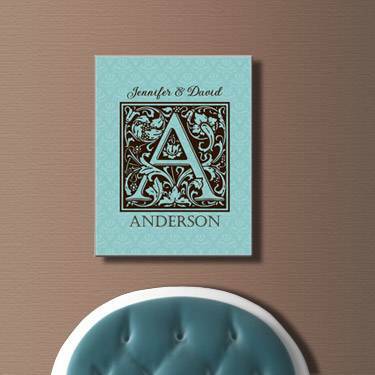 For a modern and unique wedding gift, look no further than this personalized initial panel, which makes perfect for a new house of a newlywed couple. Measuring 11″ by 14,” the striking brown and aqua turquoise color combination makes this piece of art fitting for just about any interior. This item features the surname initial of the Mr. and Mrs. centered, with the first names of each person and last name in full printed to the top and bottom of the centered initial respectively. Other impressive qualities of this customized gift include a UV-resistant glossy hardboard coating over the panel and bonding of a 5/8″ thick wood backing to ensure stability and durability of the product. With these wonderful gift ideas, you’ll definitely be able to find a suitable personalized wedding gift for your couple in mind. Face the big day and the spring season knowing that you’ve made a quality and impressive gift choice that will thrill the bride and groom for time to come!